Thank You page is a modest show by a courteous business the moment a necessary action takes place. It can be a completion of a sale or filling up of a form or anything else. But most businesses overlook the importance of this page in their business life cycle. The most predominant idea is that it is just an end to an action that is done over and out, and therefore nobody even cares to think further. Latest aspect of online marketing, social media plays a crucial role in creating a company’s online presence, getting traffic and creating brand awareness. Even Google is placing more weight on social sharing; so all you need is to have more and more people sharing your site. Allow customers to share their purchases and thoughts across social media. This provides easy traceability to your link and generates greater trust and confidence among potential shoppers. Businesses cannot afford to slow down once a sale is done; rather need to look for repeat traffic. Offering incentives helps in customer engagement, but how? Once a transaction is done, offer pop-up discounts or special offers or email your customer with coupons or deals that they can use for future purchase. However small or big a coupon or a deal is, acts significantly in bringing back your customers for further purchase. 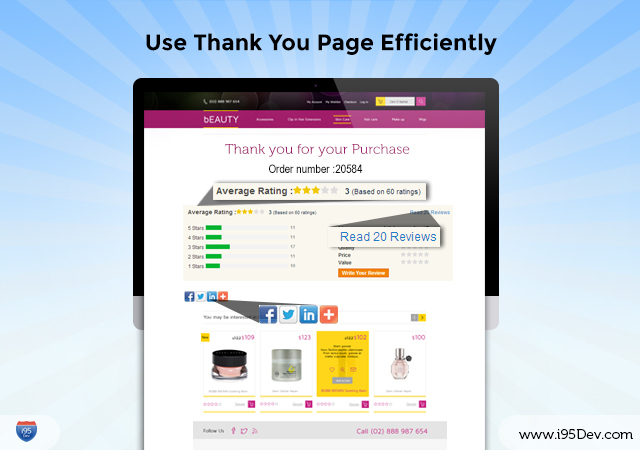 After thanking your customers for purchases, ask them for a review. Customers normally are excited after a purchase is done and this is your best time to engage them asking for a review. Drilling down helps you understand customer experience but make sure you simplify the review process and not trouble them with tons of questions. Testimonials play a vital role in deciding purchases. Placing Testimonials in your Thank You page can boost the confidence of your customer and increase your brand’s recall value. On the other hand, videos showing various products and their critical features can help cross selling of products. After a successful sale, invite your customers to join your brand community by signing up for newsletter. Encourage the customer with cheerful inspiring words as these customers on base can come back reading about your new launches thru your newsletter. It is always good to have reference from satisfied customers as they share their experience with you which have huge impact upon the prospects. As a part of your thank you message or email, allure your customers with a discounted off on the next purchase for sharing views with family and friends. This helps to grow your potential future sales.